New cool accessories and gadgets are constantly been developed for handsets, to enable us to get more out of our devices. Well I would now like to introduce you to the iRemoco helicopter for iOS Devices. 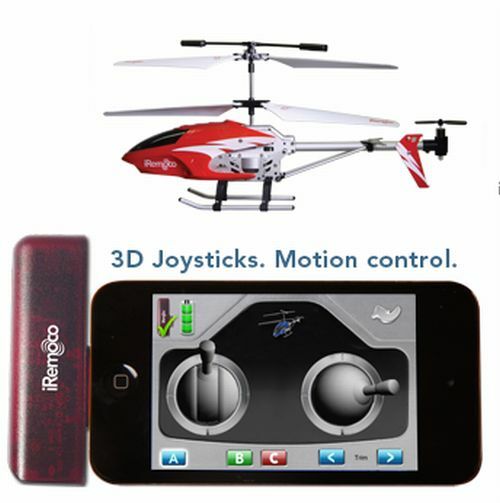 The iRemoco is a mini helicopter that includes an attachment for your iPhone or iPod Touch. With the use of the dock connector attachment to transmit the signal and an iOS application, you get to have full control of the iRemoco helicopter from your iPhone/iPod. The developers of the iRemoco helicopter are Andrew Ayres and Tom Sisterson have spent 18 months working on this project and finally have it at the mass production stage. The iRemoco helicopter has a frame made of metal, with the rotor blades made of flexible, durable plastic. It is lightweight and very well designed. The iOS software that accompanies the iRemoco helicopter enables you use the touch screen and even the motion sensor on your iDevice to control the movement of the helicopter. Unfortunately, the iRemoco is still only a prototype and not available for purchase yet. Please note that it is ready for the market, however the developers need help in raising funds to get the iRemoco into the first round of production. The two developers have formed a business called Ternosis and taken to Kickstarter (a project-funding website) to get iRemoco up and going. Backers of the cause can pledge $99, which will mean they will get one of these cool gadgets when they start to ship out. If you would like to see the iRemoco helicopter in action why not check out the video over on the iDB, site and then please return to give us your views on this prototype — would you like one?